123 Spins is a fairly new casino, having been launched back in October 2017, that is made available by Jumpman Gaming. There’s an issue with Jumpman sites that may seem small, but the more you think about it, the bigger a problem it becomes. 123 Spins, like many of its siblings on this extensive network, calls after you if you leave the site, something that is clearly supposed to be a cute touch, but one that comes with an unhealthy undertone. Visit any other tab you have open, and the 123 Spins tab will flash up with “Hey” and “Come Back”. Again, it is clear what the intention is here, but that doesn’t take away from the subtext. The online casino scene is focusing increasingly on the protection of vulnerable gamblers, and ensuring that such players do not feel forced into playing by the sites that they sign up with. For the possibility of these players taking a necessary break from playing, only to be commanded to come back by the site they are playing on, is nothing short of dangerous, and is something that undoubtedly has to change. This doesn’t make it impossible for 123 Spins to succeed, it’s just a bad touch that needs changing, but it doesn’t leave this site with a fair bit to do. Is this a site that feels capable of doing what is necessary? At first glance, the design of 123 Spins is attractive enough, a nice combination of purple and white as a colour scheme makes the site look striking, and also feel different from the majority of other online casino sites. Unfortunately, the aesthetics here go downhill steeply after that, scroll down the page past the banner across the top and you will be met by a plain white background behind a host of thumbnails. This approach can be successful, as it allows the artwork from the thumbnails to provide the colour and design for the page without the background being too distracting, but, unfortunately, with 123 Spins, the way it’s put together just makes the site feel unfinished, and that’s not the best look to have. The name 123 Spins may suggest that all there is available at this online casino is slots, but that isn’t true, well, not quite. The focus here is clearly very much on spinning reels, and the number of slots compared to all other game categories makes this clear, but with titles coming from ELK Studios, Eyecon, Gamevy, iSoftBet, Microgaming, NetEnt, NextGen Gaming, PariPlay, Playson, SG Digital, and Yggdrasil, there is more to do here, including a small number of bingo games, and a half-decent collection of table and card games. 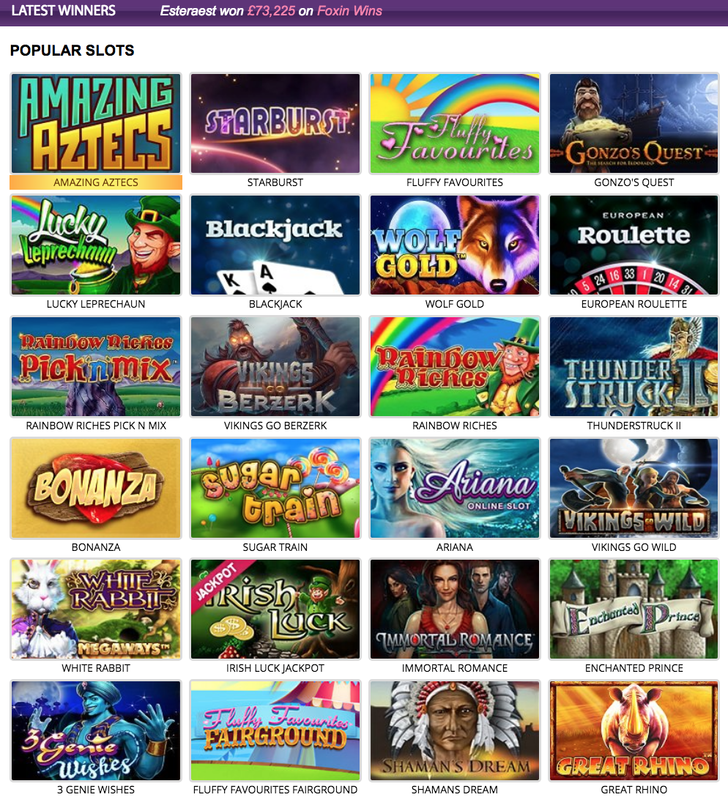 It is fair to say that unless you are a fan of slots, you will probably tire of the collection that is available here fairly swiftly and, even if you are, there are many other sites that offer many more games from many more software developers. 123 spins is not a bad site, everything it does it does well enough, but nothing it does is done to the necessary extent to compete with the giants of the industry, and that is likely to result in this site swiftly falling by the wayside like so many before it.